Need to hold something hallow? 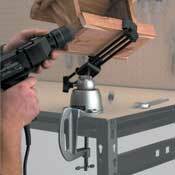 Try this tip, expand the jaws from the inside, instead of clamping from the outside. Protect the finish of your project with these add-on Jaw Pads. Neoprene Pads slip over the existing jaws. Soft and gentle, with plenty of holding power! Easy on, Easy off handle for faster jaw movement & fine tuning control. Add longer cross bars for wider circuit boards! Working on bigger boards? Multiple boards? Extend the width of any PanaVise Circuit Board Holder with our Cross Bars! Perfect for small tubes, rods or circuit boards! For 303 and 304 Vise Heads as well as 301 and 381 Vise Combos. Excellent electrical insulation with a grooved surface. These versatile neoprene pads slip over the metal arms on the 350, 366, 376 & 396 Vise Heads. These versatile neoprene pads slip over the metal arms on the 350, 366, 376 and 396 Vise Heads. For 303 and 304 Vise Heads as well as 301 and 381 Vise Combos. Recommended for high heat applications. For 303 and 304 Vise Heads as well as 301 and 381 Vise Combos. Recommended for high heat, industrial environments. For 303 and 304 Vise Heads as well as 301 and 381 Vise Combos. A non-marring alternative. 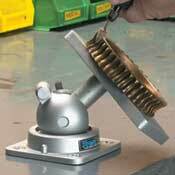 Specifically designed for use with the 366 and 376 Vise Heads. Keep your soldering iron and solder close at hand! This unique accessory is perfect for use with the 308 and 312 Base Mounts. 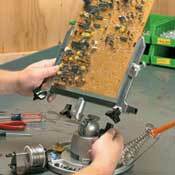 Repair your torn or damaged vacuum base pad! For use with PanaVise 380 and 381 vacuum bases.